The best source for quotes by Jim Elliot are two books. The first is his biography by his wife Elisabeth Elliot, In The Shadow of the Almighty, published by Harper and Row in 1958. It contains extensive quotes from his personal journals. The second book is a published, abridged version of the journals themselves, The Journals of Jim Elliot, edited by Elisabeth Elliot and published by Fleming H. Revell in 1978.
on page 174 (Chapter 4) of the 1978 hardback edition of the Journal and on page 108 (Chapter 11) of the 1958 hardback edition of Shadow of the Almighty. The quote is also used in the prologue of Shadow on page 15. Below is a reproduction of the actual entry for October 28, 1949 in its entirety from the journal (Collection 277, Box 1, Folder 8). 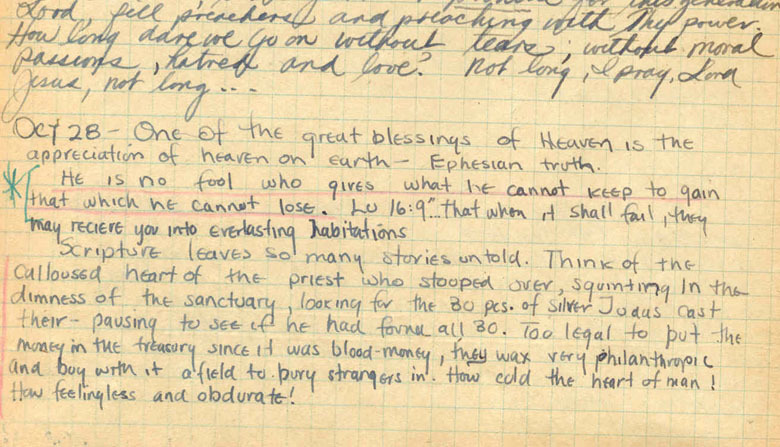 The underlining, the bracket and and the asterisk were probably added at a later time after Jim Elliot's death. Philip Henry (1631-1696), father of well known preacher and Bible commentator Matthew Henry (1662-1714), was credited with a very similar saying. In The Miscellaneous Works of the Rev. Matthew Henry..., published in 1833, is a biography of Philip by Matthew. (The original biography had apparently been published in 1699.) On page 35 of the volume, Matthew is recalling his father's acts of kindness and charity and how he used to say, "He is no fool who parts with that which he cannot keep, when he is sure to be recompensed with that which he cannot lose." Please be aware that the purpose of this page is to provide information on some of the most relevant Archives holdings relating to this often-asked question. Because of staff and time limitations, the BGC archivists can spend no more than a half-hour helping an individual researcher; we have to focus our efforts on gathering the material and making it available. In order to find all the materials in the Archives on this particular topic, you will need to personally go through the guides to the various Archives collections available at this Web site and in the Archives Reading Room in the Billy Graham Center building in Wheaton, Illinois. If your request will take longer than the half hour we can provide, you will either need to come to the Archives yourself to do the necessary research in our collections, arrange for someone to come and do the research for you, or pay to use the Archives' research services. You can also do further independent searching of the online database to explore what the Archives has on a wide variety of subjects. You will find only a very small sampling of the Archives actual documents on this Web site. Most of our Web pages only describe what is at the Archives in Wheaton. In most cases you must visit the Archives to use our collections, unless a collection (or portion of it) is available through inter-library loan or as a short-term loan for a fee. You may also find it helpful to visit Wheaton College's online catalog to its libraries and archives (including the Billy Graham Center Archives).